For groups of less than six people, Front of house staff will show you to available seats upon arrival. Arrive at door opening times to get the best choice of table, and order your food before the show. Bookings of six or more people will automatically have a table reserved; please arrive within half an hour of the doors opening to secure your table. Age restrictions are stated on the show page when booking (If unsure, please check with the Box Office on 01273 647100 Mon – Sun from 12noon – 6pm). 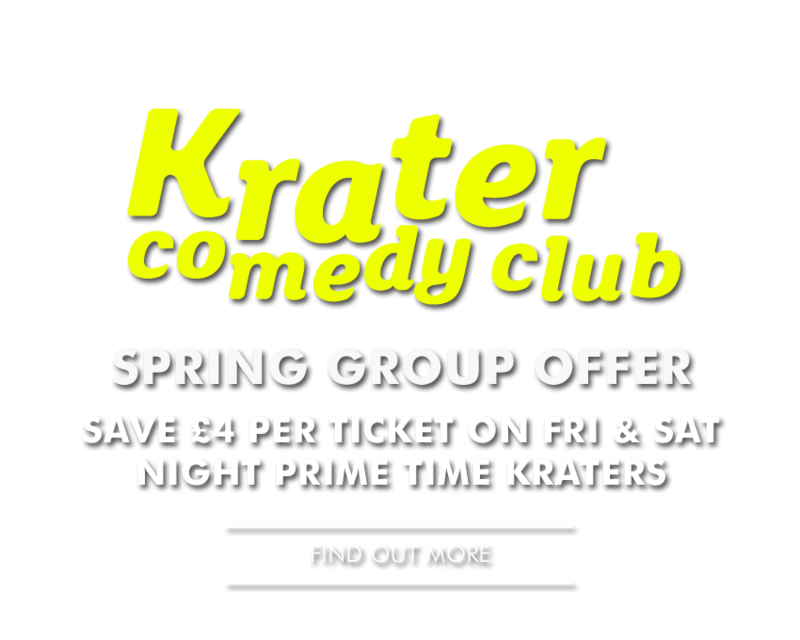 Krater Comedy Club is strictly 18+. Q. What time do doors open for a show at Komedia? A. For seated shows where food is served, doors open an hour before the show start time. For shows where food is not served, for standing gigs and for Studio Bar events, doors open 30 minutes before show start time. Please note, for our Saturday 10:30pm showing of Krater Comedy Club doors open at 10pm although a Snack Menu is served at this show. Please check individual listings to confirm door opening times. Q. What time will the show finish? A. Music : We have a live music curfew of 11pm – so you can expect any live music event at Komedia to finish by this time. Q. Will food be available? A. A full menu is served at most seated shows where you see the food logo. Save money by purchasing a meal deal ticket in advance to get entrance to the show plus a main course. An extensive snack menu is served at shows where you see the snack logo. Food is not served at standing shows or Studio shows. Q. I have specific dietary requirements. 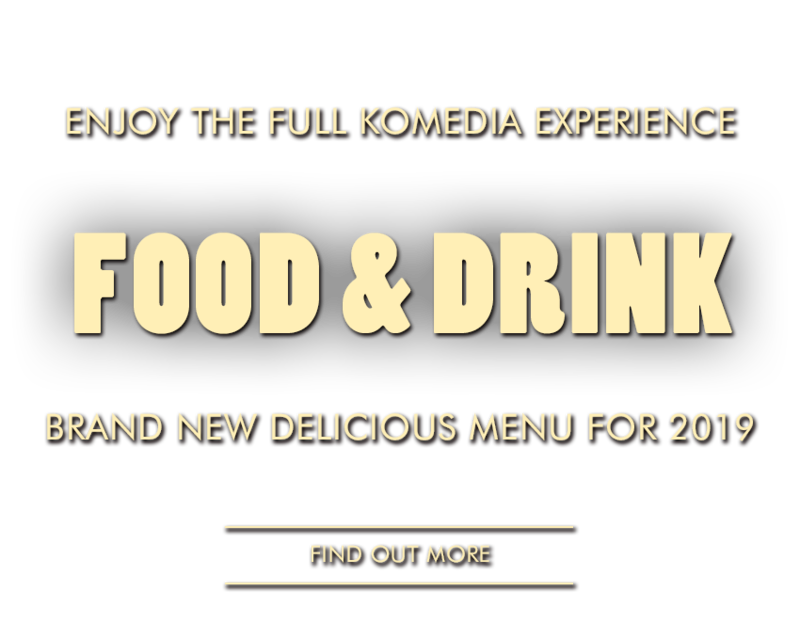 Will I be able to eat at Komedia? A. Our menus accommodate vegetarian and gluten free options. Please view our Main Menu to see if there is a suitable dish for you. If you are not sure, then please contact a member of the team with your query. We are happy to accommodate dietary requirements where possible. Payment may be made by Visa, Mastercard, Switch, Maestro or American Express. Q. Why are several different prices available for some shows? A. The different prices reflect concessions (see next question) or special offers for a certain show. Please note, ticket prices do not reflect where you will be seated as we do not operate numbered seating for our shows. Q. Who is eligible for a concession? A. Komedia offers concessionary rate tickets (when available) to people over the age of 60, unemployed, students with a valid NUS card, people with disabilities (complimentary tickets are available to carers). Please note that proof of concession will be required upon entrance. Q. Can I reserve a ticket and pay on the door? A. All tickets must be paid for in advance and we cannot reserve tickets until the day of the show. Tickets cannot be exchanged nor money refunded. In the case of a sell-out show, you may return your ticket to the Box Office where we can attempt to resell it for face value. Should we resell it, it is your responsibility to come to the Box Office to collect the money if you paid by cash or we will put the money back onto your card. Please note that this does not constitute a refund and money will only be returned if we re-sell the ticket. Terms and conditions: Tickets cannot be exchanged nor money refunded. Q. Is your online booking secure? A. 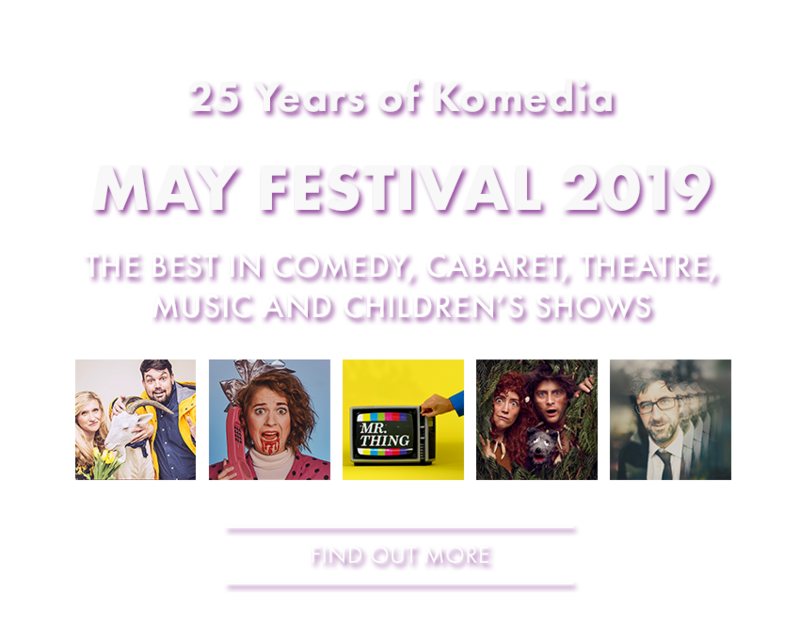 Yes, our site operates via a secure connection and your details are not shared with anyone else when you book with Komedia. Q. I booked online – when will I receive my tickets? A. If you have booked online, you will receive an email confirmation that acts as your ticket. If you have a smartphone you can show it on this, or print this out and bring it with you to enter the venue . Alternatively you can simply write down the order reference number and bring this with you. Q. I haven’t received my email confirmation – what can I do? A. Occasionally, due to certain email server’s spam filters, an email confirmation may not be able to get through. Firstly check you spam and junk files to see if the email has been sent there, If you can still not find the email please contact the box office or phone on 01273 647100 (12pm – 6pm Mon – Sun) and they will be able to resend the email in a form that should get through and give you the order reference number for extra security. Q. I have booked online for a large group but we will be arriving separately – what should we do? A. When you arrive, bring your e-ticket and come and see the door staff who have a list of order reference numbers and customer names. They will count the members of your group in as they arrive so it does not matter if you do not arrive at the same time. Please note there is currently no booking fee when paying in person. Tickets are available from the Duke’s at Komedia cafe at the front of the building from 10am – 8pm. The Komedia box office is normally open from show door opening times on evenings when a show is taking place. Bookings online cost £1 per ticket (with a maximum £6). A postal charge may also apply if we are posting tickets. Telephone bookings cost £1 per ticket (with a maximum £6).